Cables look wonderful on hats. They look wonderful on socks, or on gloves, or on sweaters. They even look pretty good on pillows and blankets. But one place they don’t always look so good is the simple rectangular scarf. Cables tend to have one side that looks intricate and beautiful, and one side that looks much worse. It is easy to arrange a hat, or a sock, or a sweater, or even a blanket, so that only one side is visible. A scarf? It's quite a bit harder. So I started thinking about reversible cables. 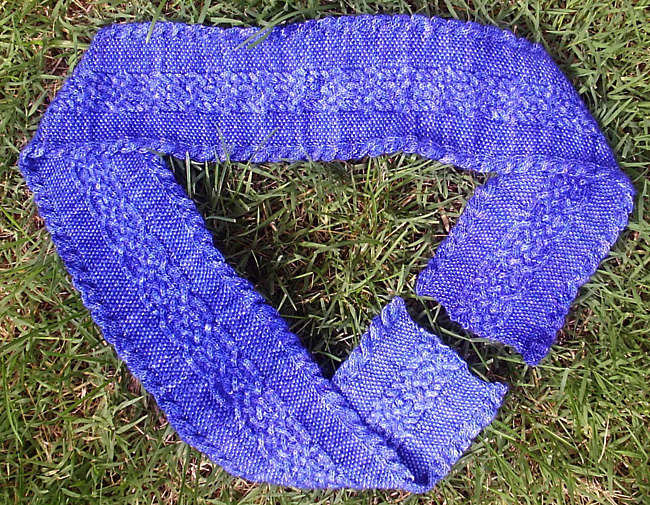 I've made a few scarves with reversible cables before, but for this one, I wanted something special. I wanted a relatively large, elaborate pattern running down the middle. I wanted it to look different on both sides, but I still wanted to have it look good on both sides. 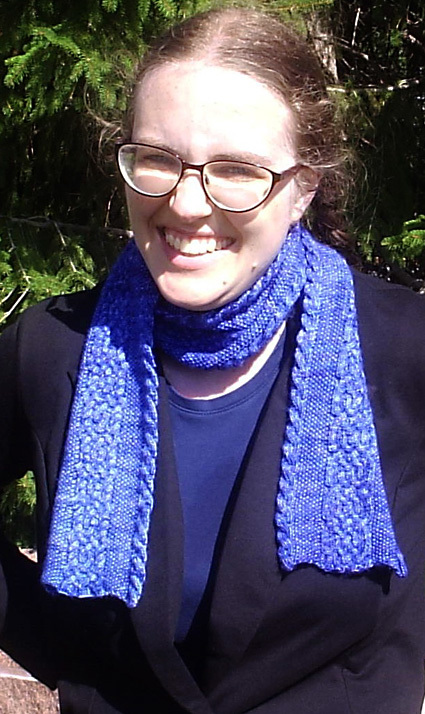 Note: a somewhat shorter scarf, about 30--36 inches long, may be made with 1 skein. Note: A third skein is needed if you wish a longer scarf. You can adjust the width of the scarf by knitting with a thicker or thinner yarn, at a looser or or tighter gauge. 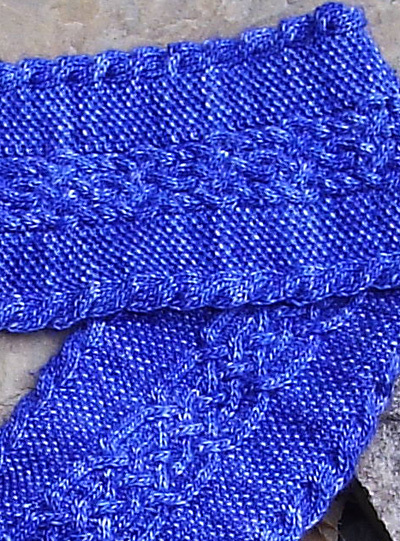 You can also adjust the width by adding or subtracting stitches in the seed stitch panels; the blue scarf has seed stitch panels 10 stitches wide, and the cream scarf has seed stitch panels 8 stitches wide. Rib-Cable: Slip 4 to cable needle and hold in front, (k1, p1, k1, p1), then (k1, p1, k1, p1) from cable needle. Numbers for Blue version are first; numbers for Cream version in brackets after. Row 1 [WS]: (K1, p1) 9 times, (k2, p4, k2) 3 times, (k1, p1) 9 times. Row 2 [RS]: (K1, p1) 4 times, (p1, k1) 5 times, (p2, k4, p2) 3 times, (p1, k1) 5 times, (k1, p1) 4 times. Row 4 [RS]: (K1, p1) 4 times; (p1, k1) 5 times, p2, (C4R, C4L-Rev) twice, C4R, p2, (p1, k1) 5 times, (k1, p1) 4 times. Row 6 [RS]: Rib-Cable, (p1, k1) 5 times, (T4R, T4L) 3 times, (p1, k1) 5 times, Rib-Cable. Row 7 [WS]: (K1, p1) 9 times, (p2, k4, p2) 3 times, (k1, p1) 9 times. Row 8 [RS]: (K1, p1) 4 times; (p1, k1) 5 times, k2, (C4R-Rev, C4L) twice, C4R-Rev, k2, (p1, k1) 5 times, (k1, p1) 4 times. Row 9 [WS]: As Row 7. Row 10 [RS]: (K1, p1) 4 times; (p1, k1) 5 times, (T4L, T4R) 3 times, (p1, k1) 5 times, (k1, p1) 4 times. Row 12 [RS]: As Row 4. Row 13 [WS]: As Row 1. Row 14 [RS]: Rib-Cable, (p1, k1) 5 times, p2, k4, p2, T4R, T4L, p2, k4, p2, (p1, k1) 5 times, Rib-Cable. Row 15 [WS]: (K1, p1) 9 times, k2, p4, k2, p2, k4, p2, k2, p4, k2, (k1, p1) 9 times. Row 16 [RS]: (K1, p1) 4 times; (p1, k1) 5 times, p2, C4R, p2, k2, C4R-Rev, k2, p2, C4R, p2, (p1, k1) 5 times, (k1, p1) 4 times. Row 17 [WS]: As Row 15. Row 18 [RS]: (K1, p1) 4 times; (p1, k1) 5 times, p2, k4, p2, T4L, T4R, p2, k4, p2, (p1, k1) 5 times, (k1, p1) 4 times. Rows 19-27: As Rows 3-11. Row 28 [RS]: Rib-Cable, (p1, k1) 5 times, p2, (C4R, C4L-Rev) twice, C4R, p2, (p1, k1) 5 times, Rib-Cable. Row 29 [WS]: As Row 1. Row 30 [RS]: As Row 2. Row 31 [WS]: As Row 1. Working from chart or written instructions, work Rows 1-2, then repeat Rows 3-18 until scarf is just about desired length, then work Rows 19-31. Weave in ends. Block by washing gently in warm water with mild detergent, shampoo, Soak or Eucalan. Press between towels and lay flat to dry. 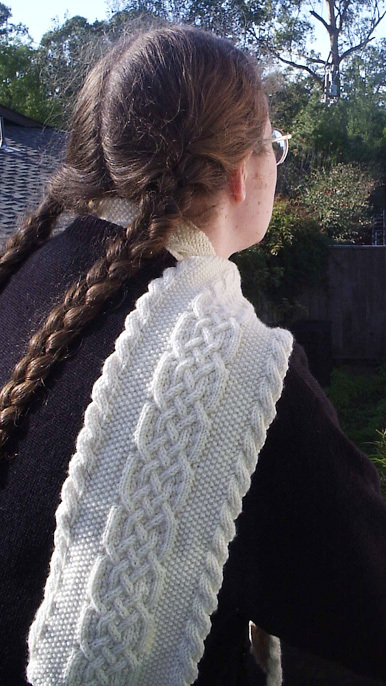 Note: I got better results when I blocked the scarf with the Saxon braid side facing down. 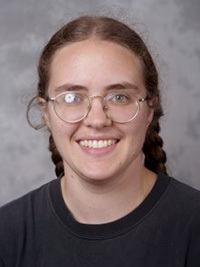 Ariel is a mathematician at the University of Minnesota. 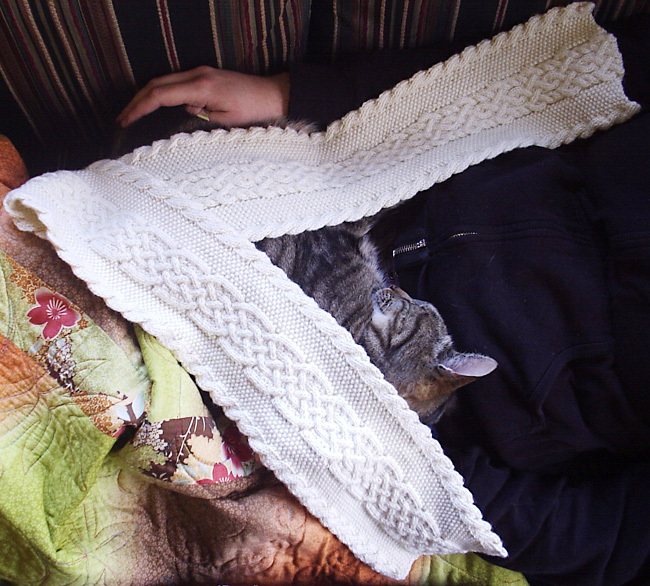 In her spare time, she reads, folds origami, and, of course, knits. You can read about her knitting projects in her journal.